What is Trash The Dress, you ask? A style of wedding photography that contrasts elegant clothing with an environment in which it is out of place. As professional Playa del Carmen wedding photographers, we can tell you that Trash The Dress sessions have taken our industry by storm! The artistic contrast of the elegance of a bride in her wedding dress by placing her in an environment which is out of place from the traditional wedding scene is pretty epic. Is a Trash The Dress photography session right for YOU? The symbolism of trashing your wedding dress is seen by some brides as a bold statement that their wedding is finished, and that they are never going to need to wear a wedding dress again. And of course, you get wedding terrific photos worthy of the pages of Vogue! A trash the dress session will breathe new life into a wedding dress that would ordinarily get worn for only one short moment in your whole life and then be packed away in a garment bag forever. You will get to put it on again (yay!) and have a blast creating new memories. The ocean may give your wedding dress a good scrub, often leaving it cleaner than it was after your wedding reception. And since the Riviera Maya jungle cenotes are fresh water, they should not present the same concerns you may have about salt and sand. If your wedding dress is 100% polyester, you should not have any concerns about actually ruining your wedding dress by getting it wet. Hooray for synthetic fibers! Will you ruin your wedding dress by doing a trash the dress session? You might, yes. If your wedding dress is made from a natural fiber such as cotton or linen, and most especially silk, then getting it wet puts it at risk of shrinking and/or ending up as rumpled mess. 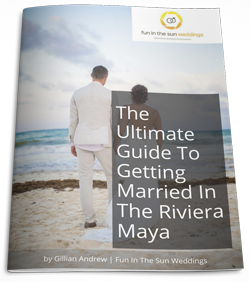 If your wedding dress has intricate beading or delicate lace, you should be comfortable with losing a few beads to the ocean or ripping the lace on an underwater jungle root in the cenote. It’s important to note that in 2012, a bride drowned while doing a trash the session in a lake. Her wedding dress was too heavy and it ended up overwhelming her. If you plan to wear a Cinderella wedding gown for your beach wedding or one with heavy layers of fabric (Which, by the way, we DO NOT recommend!) you could be flirting with disaster by going for a swim in it. If you think you would like to do a trash the dress session, but you do NOT want to risk ruining your wedding dress, then you can always do the shoot in a different dress! Pick a wedding dress look alike, or just go with a totally different look altogether. OR don’t go in the water! The whole point of a trash the dress photo shoot is to be creative. You can climb a Mayan ruin, or eat a messy taco at a street cart on a vibrant Mexican street. There are endless ideas that do not end in you getting soaked! If you hope to preserve your wedding dress in case your daughter wants to wear it for her own wedding some day, well, you need to give your head a shake! 30 years from now styles will be so completely different, and your daughter will no more want to wear your wedding dress then than you want to wear your own mother’s now! So what do you think? Will YOU Trash The Dress? We want to hear why in the comments below. 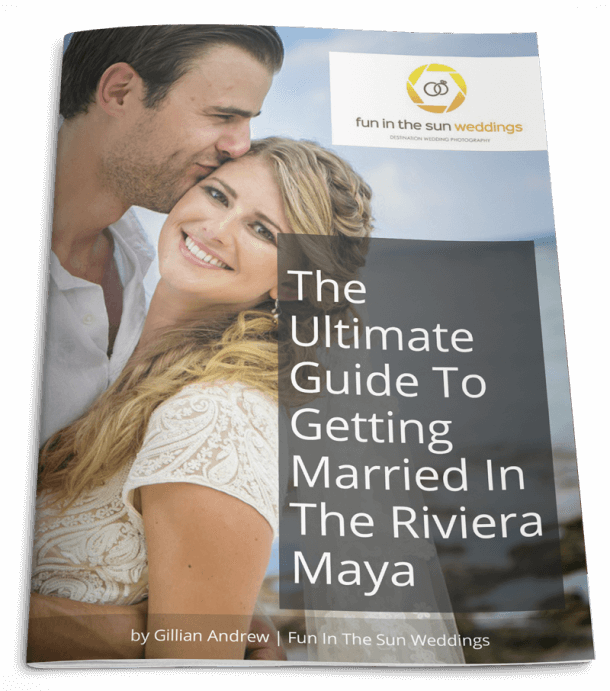 If you are planning a destination wedding in the Riviera Maya, Mexico, and would like to do a Trash The Dress photography session, then contact us right now! We are Fun In The Sun Weddings, the best Playa del Carmen wedding photographers on the beaches of Riviera Maya, Mexico!